My name is Paul, I have found a very easy way to build a Solar Parabolic Cooker. I got the old aluminum plates used in printing, so they really last. and cheap ,as some of the printers just send them to the dump in some places . 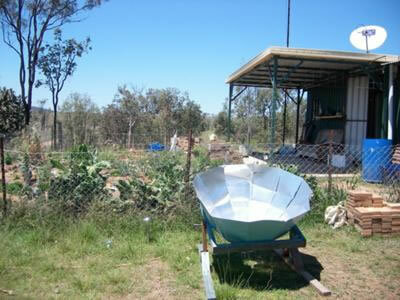 Here is a pic of my Solar Parabolic Cooker. Thank you for you site. so I can cut them out and make a shallow parabolic cooker, maybe you can help me ? I live in Adelaide am making a solar oven. Do you know where I would be able to get printer aluminum sheets from? Sounds a great idea. making the smaller parabolic cooker? Did you ever get a recommendation for the size yo should make your smaller parabolic cooker, for heating coffee or tea? I want to do one of those and am wondering what to do. I saw a page where someone made one from a lampshade that they said brought water to a boil in two minutes, but have not been able to find that page again. Thanks so much for any response. (no point in reinventing the wheel ) You may need to put wing on it so you can bolt them all together these are printing plates that are used in printing, easy to work with so you can cut with scissors,and bend on the end of a table ,and all you need to put it together is a pack or two of very small nut and bolts .You need to find a nice printer that will give you, or let you buy very cheap the plates to build this cooker. I used 4 sheets. Your oven looks great! Do you have written instructions you could share with me? Is there a particular gauge of aluminum you would suggest? I have been fascinated with Australia since I was in high school. In what part of Australia do you live? My husband and I live in SW Florida and love warm water and the tropics. If we were to take a 'Holiday,' as you say, where would you suggest we go? I was thinking of Brisbane or Perth. Really, it is amazing. I also want to build such type of Solar Cooker for purification of Water.